KORE3's ø325mm C5/C6 Big-Brake Kit for the American Touring Specialties (ATS) AFX spindle and C5/C6 Corvette applications are bolt-on, high-performance, 5th/6th generation (C5/C6) Corvette based brake kits. These kits are compatible with all C5/C6 based applications, including the popular ATS AFX modular spindles. Build your kit using the pull down menus below to best suit your performance needs. Please include your application in the comment box below so that we can supply the proper hoses with your kit. Please contact us with any questions you may have with configuring your ATS AFX/C5/C6 brake kit. 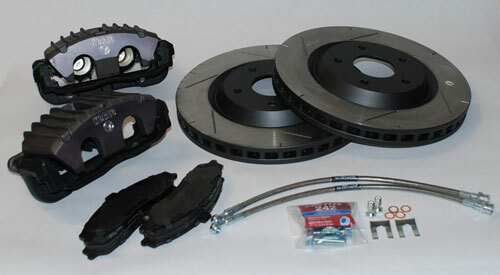 This KORE3 big-brake kit is designed for all C5/C6 compatible knuckles/spindles, including ATS AFX spindles. Kit installation requires basic hand tools and is 100% bolt-on. Minimum ø17" wheels are required with C5/C6 ø325mm diameter rotor kits for caliper to wheel clearance, however not all ø17" wheels fit. Please verify fitment prior to ordering using the appropriate KORE3 fitment template. Wheel fitment is the buyer's responsibilty. Please contact us if you have any questions regarding your specific application or the proper use of the templates.